The owner of a home in Sydney’s north shore approached Paragon with an unbearable problem. It is often seen in residential and also commercial building apartments governed by strict strata guidelines and body corporate rulings. Heat was a big problem in the summer. This was intensified in summer afternoons as the direct heat in the kitchen was unbearable. Fading was the other issue as the sun streamed in on the new kitchen doors. In order to combat the heat & damaging UV rays of the sun, the owner would have had to put an awning on the exterior of the building and heavy duty blinds. This would compromise the view & defeat the purpose of having glass installed in this area. The air conditioning was running at full capacity. The owner of the home did not want to change the external and internal look of the building. Traditional window films are either dark or highly reflective and also change the external appearance of the building giving a ‘patchwork’ effect if some areas are tinted and other areas not. 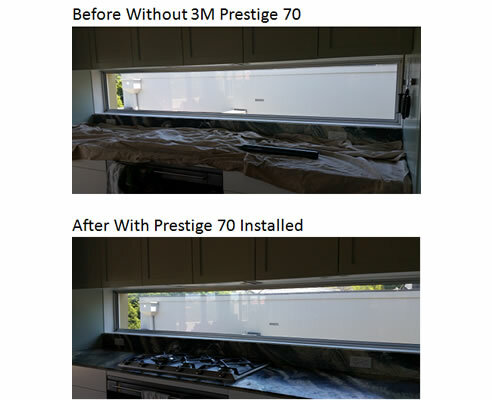 Paragon performed the installation (1 window) in a way which resulted in virtually no disruption to the owner in a straight-forward and trouble free installation within one hour. The results were immediately noticeable. With the air conditioning running at a lower level, the savings in energy costs in summer would be genuinely substantial.